An excerpt from Schmidt’s The United States Occupation of Haiti, 1915-1934 (1971). Schmidt was a historian who taught at the State University of New York at New Paltz. 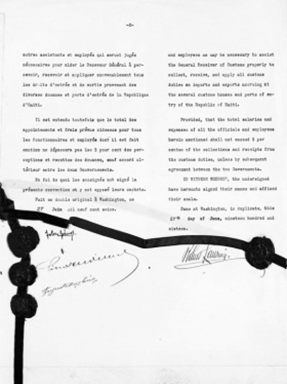 The Haitian-American Treaty of September, 1915, provided that the United States would establish and officer a Haitian gendarmerie. The practice of developing an American-controlled native military force had previously been employed by the United States in Puerto Rico and Cuba, and, while the Gendarmerie was being organized in Haiti, corresponding Guardias Nacional were being set up under American auspices on the other end of the island in the Dominican Republic and in Nicaragua. These constabularies were intended as efficient, nonpartisan, centralized forces sufficiently powerful to ensure continuity of pro-American political regimes and to eliminate the problem of instability caused by cyclical revolutions. While the political machinery was thus being strengthened, the marines simultaneously were enhancing the military effectiveness of the Gendarmerie and the marine brigade by means of an extensive road-building program. 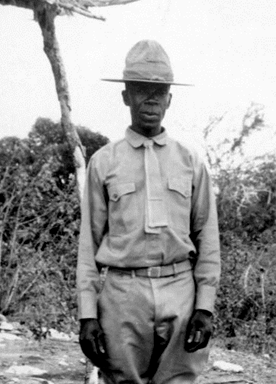 Lacking adequate funds for a major road-building program because of the fiscal pauperage of the client-government, the Americans revived an 1864 Haitian law, discovered by [an American Marine commander named] Smedly Butler, by which peasants were required to perform labor on local roads in lieu of paying a road tax. This system, known as the corvée… resulted in the construction of an impressive network of roads connecting major towns, with the greatest achievement being a 170-mile unpaved highway between Port-au-Prince and the northern center of Cap Haïtien. The peasants, however, resented the forced labor, and resistance to the corvée soon developed into a full-scale revolt…. The roping together of workers was especially upsetting to the peasants, since it recalled legends of French colonial slave gangs.